Optimal Feedback Control (OFC) has been proposed as an attractive movement generation strategy in goal reaching tasks for anthropomorphic manipulator systems. Recent developments, such as the Iterative Linear Quadratic Gaussian (ILQG) algorithm, have focused on the case of non-linear, but still analytically available, dynamics. For realistic control systems, however, the dynamics may often be unknown, difficult to estimate, or subject to frequent systematic changes. 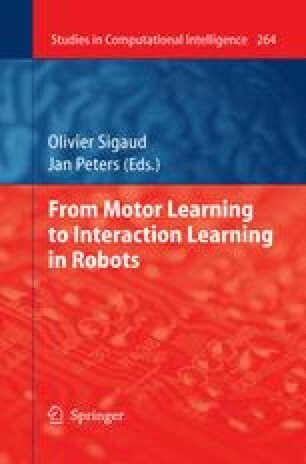 In this chapter, we combine the ILQG framework with learning the forward dynamics for simulated arms, which exhibit large redundancies, both, in kinematics and in the actuation. We demonstrate how our approach can compensate for complex dynamic perturbations in an online fashion. The specific adaptive framework introduced lends itself to a computationally more efficient implementation of the ILQG optimisation without sacrificing control accuracy – allowing the method to scale to large DoF systems.